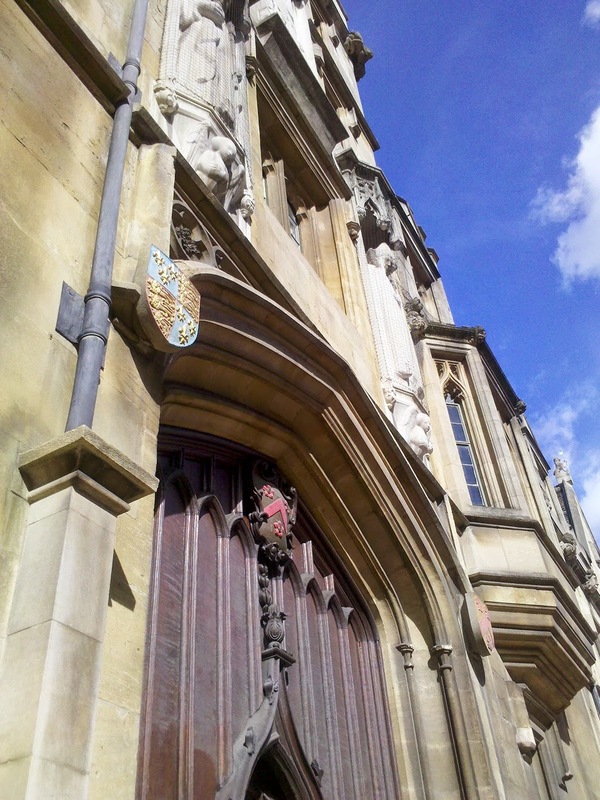 Oxford is lovely, old, and filled with high walls, locked gates, and closed doors. It is a secret society, I will never know the handshake. 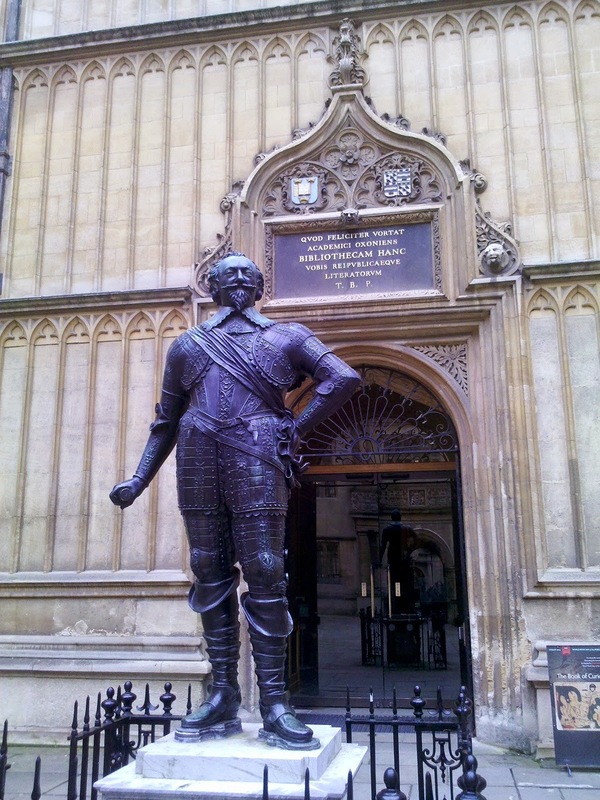 I know, I know, Oxford is not a “public” university, there should be different notions of access, I cannot expect the walls and gates and doors of Oxford to be open to all comers, because it’s just never been that way. You have to climb up pretty high to see into the enclosures of Oxford. No Smoking I can get behind. SILENCE PLEASE is different. 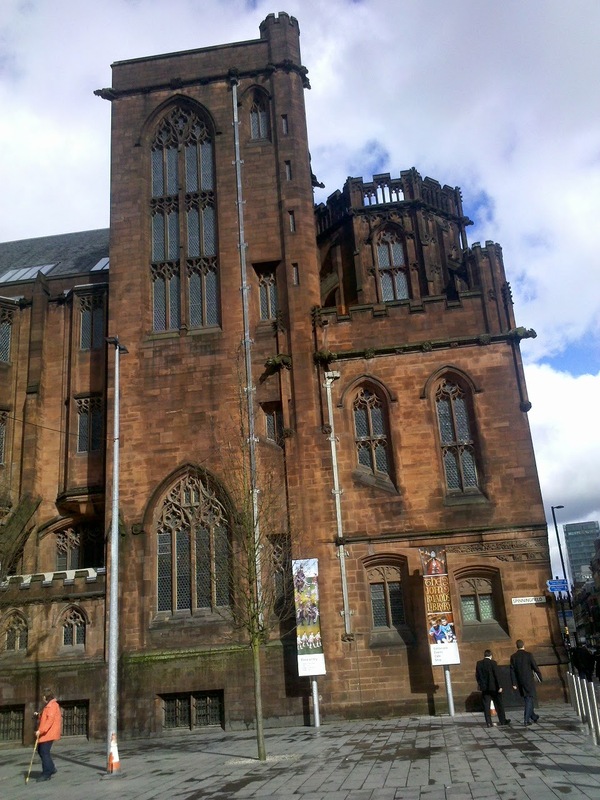 The Rylands Library, on the other hand, is a Special Collections library associated with the University of Manchester (a red-brick state school). You can walk right in, no charge, even if you are not a student (which is not necessarily the case at UCL, even, where you have to swipe your bar-coded-card to enter every library, and most of the academic buildings). 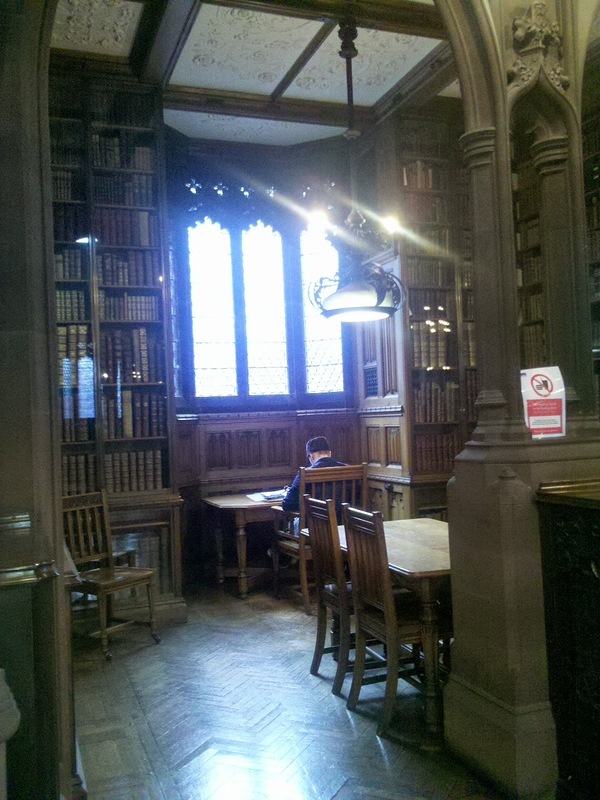 The Rylands is a Gothic Cathedral to knowledge (I’ve blogged about libraries that make me think of ecclesiastical monuments before), and the reading room is open to anyone who wants to work in there, even if they are not working with the Rylands collections. 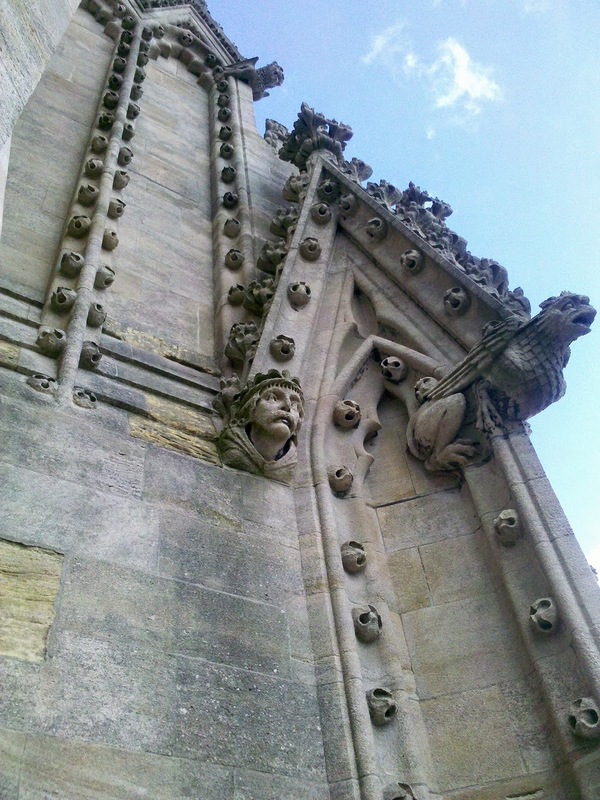 It’s a beautiful building, and a rare example of an inspiring space that is also accessible. 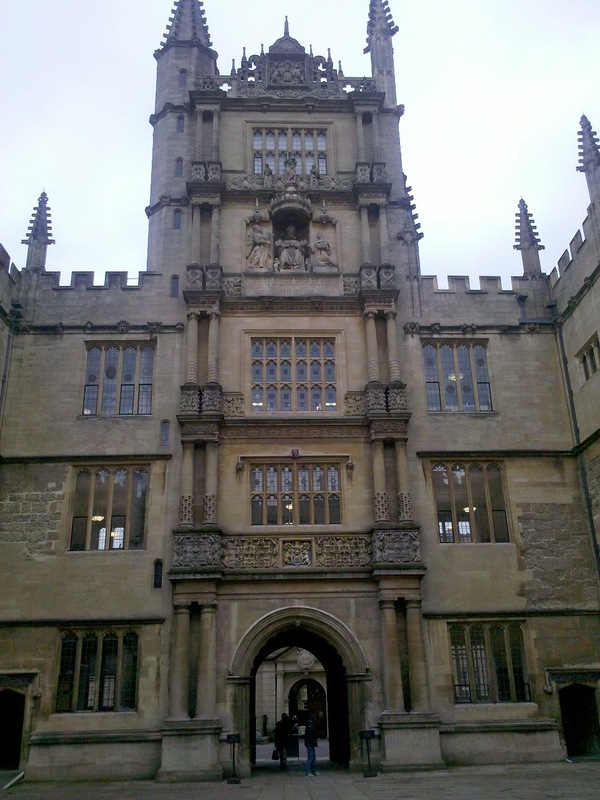 We talked briefly in our Spaces, Places and Practices seminar about the impact of spaces, in particular Traditional Library spaces that invoke places like the Bodleian and Rylands. But Traditional Library spaces, while they can be used by students and faculty to get themselves into a desired state of mind (for reading, for writing, for scholarship of various kinds), can also feel exclusionary. It’s as if some students internalize the signs that the Bodleian puts up (and sells in their gift shop! ), and transfer that to all library spaces. It’s not enough to be respectful of the space, you have to act so that they cannot tell you are there. SILENCE. I understand the utility of focus and quiet. I understand less the signals that emphasize the otherworldly nature of scholarship to the point of alienating people from the traditional places of scholarship. I am not convinced they are necessary. 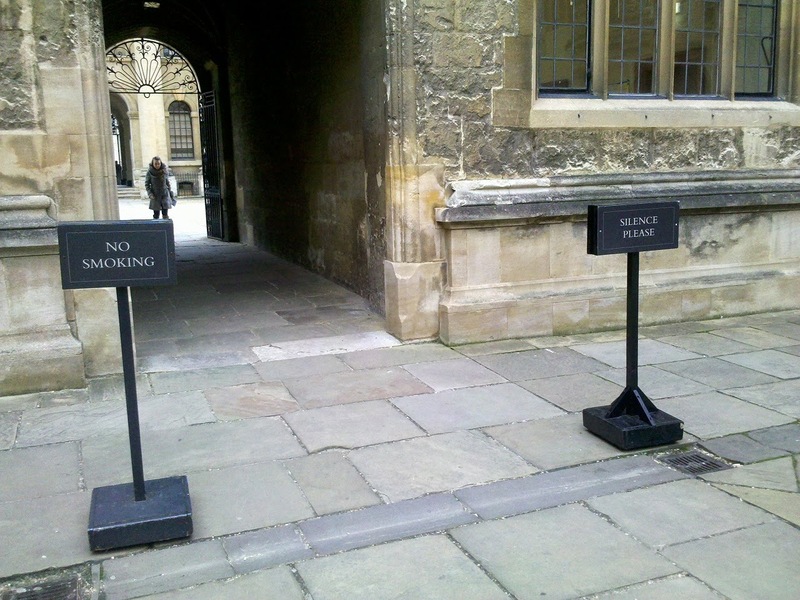 They also make me want to stomp my boots and dance around in the courtyard of the Bodleian. Probably not my dance partner, though. This entry was posted in Uncategorized and tagged engagement, fieldwork, libraries, library ethnography, library photos, noise on April 11, 2014 by dlanclos. Field Trip! NC State Hunt Library and Spaces to Think With. On Wednesday I visited not just NC State for the first time ever, but I got to have a comprehensive tour of the new James B. Hunt Library. They had an open house yesterday, and the place was full of people who work in libraries (visitors came from all over the region, including out of state) being led around the amazing spaces. There are pictures of the Hunt library all over the internet–I reproduce mine here not because they are fantastic photos, but because I took pictures of things that help me think about library spaces, and about what is possible in our own spaces at Atkins (which I’ve been uncharacteristically (for my blog) chatty about recently). It is an objectively spectacular space, and the fact that not everyone has the resources to create such a space should not deter people from going into what NCSU has created, learning from it, and dreaming big. I intend here (and everywhere) not just to think about spaces, but to think with spaces, not just fancy ones like there are at Hunt, but in the more mundane everyday spaces in which our students and faculty find themselves. can use for prototypes for classes, or just having fun. I am going to blog here mostly about space, although the tech stuff possible in the Hunt library is just as cool, and just as worthy of anyone’s attention; for example, the fact that students and faculty now have 3-D printers at their disposal in the Hunt makerspaces. The Hunt library is, to my mind, the biggest branch library I have ever seen. It is the library for the new Centennial Campus at State, which means its primary users are in Engineering, Textiles, and other science programs. It is also envisioned as a “second main library” for the entire university, and I will be interested to see what other constituencies use the spaces in that building. They are undeniably attractive. Color has been used in simple but effective ways to mark places that students need to look for. Red is for Asking for Help (as well as the Wolfpack). All people going into and out of the library have to pass by the Ask Us station, which is not just an info point, but an all-services point, where students can go to for reference, technical, and circulation help. In addition, workers can be deployed (via walkie talkie) to parts of the library where people need help (this is apparently very popular for IT type help). Reference specialists can be called from other parts of the building if a question is particularly in-depth. Books that are retrieved by the “Book Bot” are put in this space within five minutes of the request. And hey, let’s talk about that Book Bot. Entering on the 1st floor of the Hunt Library gives you a great view of the “back” of the automated vertical storage unit, which holds 1.5 million volumes. Books, folios, microfilm, and DVDs (among other things) once requested, can be made available for patrons in 5 minutes (and retrieved from the Ask Us station), or delivered to faculty offices. They are sorted by size, and bar-coded for identification (although they are also RFID-ing each thing that is circulated, with the hope that at least the most circulated things will be RFID-tagged eventually, if not the entire Hunt collection). This is the “front” of the system, showing one of the robots that retrieves the books, with one of the bins, showing how the books are sorted. So, yeah, the system is cool, and really makes me think about the future of stacks maintenance, but what I was struck by was what NCSU’s library IT has built to make it possible to browse closed shelving (it’s currently in Beta). They call it Virtual Browse, and it’s a touch screen that is currently mounted on the 1st floor, before you enter the library proper, between the large windows that give you a view onto the back of the Book Bot. This allows for browsing the Hunt collection in a way that is simply not physically possible anymore, given that the books are all in the automated storage system, and that it was never possible to look at the physical collection and browse the electronic resources at the same time. The Virtual Browse includes electronic resources as well as physical. This exercise in stacks virtualization, I think, is not just useful for libraries with closed/automated/off-site collections, but for all of us. In my experience, many of our patrons experience our stacks as “closed” even if they are technically open, because they don’t know how to navigate or read the stacks. This tool allows them to navigate the stacks and find things even if they don’t understand the call number system, even if they aren’t exactly sure where in the building those books are. I think I’m more excited about the virtual browser than I am about the book-finding robot. 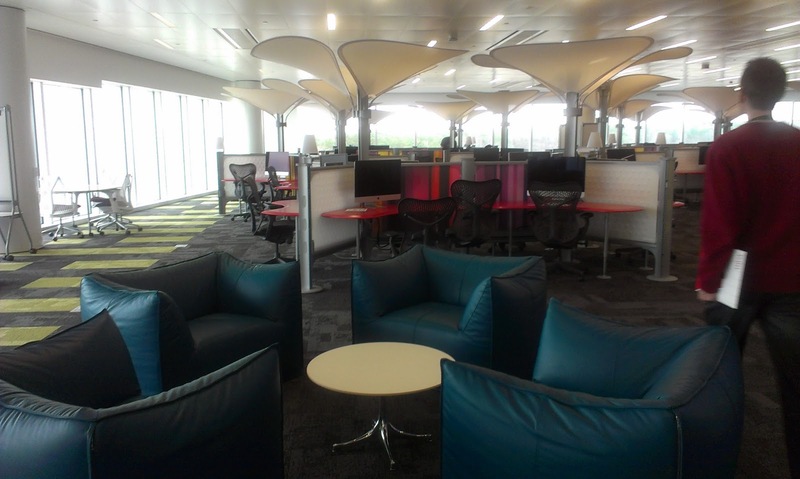 The collaborative work spaces in open parts of the Hunt library (spread across 3 floors) are colorful and configured in a variety of ways (with very attractive and fancy furniture). Some booths. This one has a view beyond to the Graduate Reading Room. 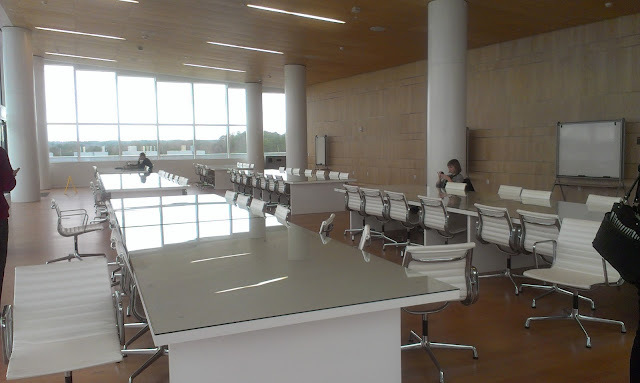 Some tables with task chairs, rolling whiteboards, stools. (the computers were Coming Soon). There are also spaces that evoke the design trope of the reading room, also spread across at least 3 floors of the Hunt Library. I especially appreciated the simple trick of integrating physical books into spaces for effect. The silent study reading room at one end of the main floor is lined on at least two sides with book shelving. The rain garden reading room just before that integrates some of the reference collection, faculty book collection, and new books into the furniture arrangements. What books do here is set expectations, they read “library” to people, and they say, without any signs of any kind , volumes (ha) about where people are once they walk into those spaces. When we start downsizing our physical collections, I think we who work in libraries would do well to think about the other properties of books– to think carefully about all the different ways that books speak to our communities, beyond the delivery of content. And here’s the thing: we don’t have to have all the resources in the world to engage in the kind of thinking that NCSU put into its Hunt Library spaces. I think (to be utterly immodest) that we are trying to do that kind of thing in Atkins at UNCC, right now. Every library should aspire to be: clear about what is where, beautiful in its execution of design, deliberate in providing a variety of spaces, and thoughtful about how and where to deploy appropriate technology, and dedicated to the staffing levels that create seamless access to services and resources. We need to think with the spaces we already have, pay attention to what is trying to be done in those spaces, and imagine beyond what is there now to what could be. This entry was posted in Uncategorized and tagged #anthrolib, #HuntLibrary, #NCSU, academic work, collaboration, computers, furniture, library photos, space, workspaces on March 8, 2013 by dlanclos. We have created configurable furniture arrangements in some areas, and more fixed arrangements in others. This picture shows the T1 touch screen tables (which also have screens at the head of the table, so students can plug in and share from their laptops. This is a view into one of our new group study rooms, with tables that are wheeled as well as wheeled task chairs. Surfaces near the digital screens allow students to share from their laptops, and there is also a dedicated computer for them to work from if they do not have their own device with them. Whiteboards and the glass walls are meant to be written on (and are). The space just outside of the library cafe has been set up to be more cafe-type seating, but with larger low tables, to accommodate the need to spread out with laptops, books, notebooks, and even more than one person’s “stuff” that they are working with. There are outlets in the wood-paneled pillars, to allow for student to plug in wherever they want to work. The most configurable part of the open space (that is, the space not contained in the study rooms), has more of the wheeled tables and task chairs, as well as some soft seating (relatively lightweight, so it can be moved around), rolling whiteboards, and movable privacy screens. I think it’s all pretty cool. Our students seem pretty happy with it so far. We had a fancy grand opening for the space, and are grateful to all of the work that went into the design and building of it. Some of the work was done by me, and students under my supervision, in the form of studying the kinds of behaviors that go into collaborative work, and thinking experimentally about how to reveal the best configuration of space and technology to facilitate effective student learning. In many learning space design scenarios, the opening is the ending. Universities continue to build new spaces, open them, and then walk away without thinking about what comes next. What did they get right about the new spaces? What did we get wrong? How can we improve it? When can we make changes? I wonder sometimes if there is a fear of looking bad, somehow, if one goes in and makes changes to brand new spaces. As if the planning wasn’t good enough, and that’s why we need to change things so soon after the opening. I hope that is not the case, because we are already looking at the new spaces and thinking about things we need to change, to better respond to how people are actually using the space, rather than assuming that they are using the space as we imagined they would. Sometimes, people just do their own thing. Allison created maps of our ground floor using Revit, and then added color for movement or activity using Adobe Photoshop and Illustrator. She mapped the kinds of activities people were doing, and also where people walked when they moved through the space, over the course of her observations. First up: the activity maps. This shows where people were eating in the course of her observations (about 8 hours altogether). The heavily blue areas are adjacent to the library cafe. 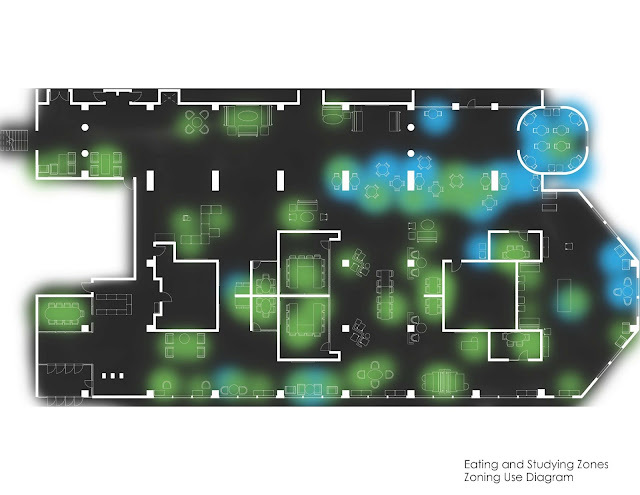 But eating is clearly happening near the nice windows overlooking the Student Activity center (on the right, in this diagram), and in the central parts of the spaces. This is where studying is happening in the new space. All over. This is where talking in happening in the space. Also, all over. When we overlap the maps for eating and studying, we see that they are not mutually exclusive areas. These maps were created from afternoon observations–if they included evening hours, we know that there would be even more overlap. Atkins library has allowed food and drink in its spaces (except in Special Collections) for several years, now, and this shows that we are right to not treat these activities (eating and studying) as mutually exclusive. Can you study and talk at the same time? Our students can and do. While some areas clearly show one thing or the other happening, the overlap is significant. Just because students have a laptop open does not mean they are studying. Likewise, just because they don’t have a laptop, doesn’t mean they are not studying. These maps are beautiful and informative, and of course are only part of the picture. Next post, I will talk about the maps Allison created that show how the density of occupation varies, as well as length of stay, and the maps that show circulation patterns through the space. I will also have pictures of what the spaces look like when they are occupied! 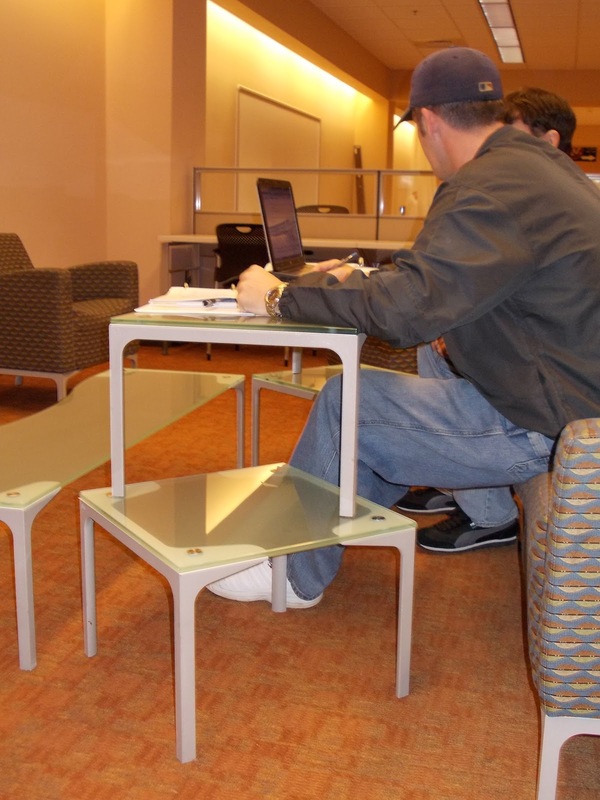 This entry was posted in Uncategorized and tagged #anthrolib, #clubatkins, #uncc, academic work, collaboration, furniture, library ethnography, library photos, space, work, workspaces on February 22, 2013 by dlanclos. Outside learning spaces at UNC Charlotte. So I went to THATCamp Piedmont in Davidson, NC in early May, and attended Mark Sample’s Spacehacking panel. The panel was full of faculty whose concerns were largely classroom based, and whose desires seemed to centered around how to shake things up physically in classrooms, so students are engaged, while at the same time meeting expectations that materials are presented by professor to students. We brainstormed about furniture, digital tools, sitting and standing, taking the professor out of the front of the room (and the pedagogical challenges therein), expressed concerns about accessibility, and speculated about non-classroom-based work environments (like, the great outdoors!). Calling something like a classroom a “learning space” implies that they are also “teaching spaces”–the direction of that teaching has traditionally been from professor to student, but increasingly we are asking students to teach each other, and occasionally to teach us about the materials we wish them to be engaged with. Classrooms in university environments are frequently locked into particular configurations, especially the auditorium-style rooms with bolted-down chairs, immovable tables, and a very fixed focal point at the front of the room. The room we were in during the panel (in the Center for Teaching and Learning in the E.H. Little Library at Davidson College) was very configurable, with desk-height tables on wheels, comfortable task chairs, and whiteboards along the entire perimeter of the room. It still had a smart podium at one end of the room, requiring whoever was needing to present materials to treat that side of the room as the “front” (there was also a smartboard there). It was also, apparently, not a terribly typical learning space at Davidson (though it was a very in-demand space!). During the panel and after I was thinking about Atkins library spaces, and the changes we’ve already made that have resulted in big differences in student engagement in learning spaces. 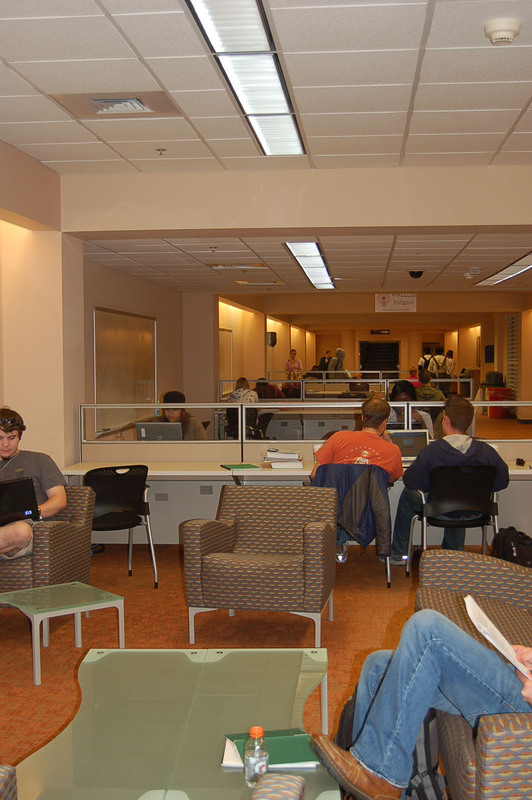 For example, my colleague Heather McCullough, the head of our Digital Scholarship Lab, came across a group of students studying in our ground floor collaborative spaces during finals week. There was one student at a whiteboard, outlining principles of Economics, being listened to by a group of his classmates. The student’s classmates asked him,”how do you know this stuff? ?” He told them, “I did the practice problems in the back of the textbook.” And his classmates said, “Can you tell us how to do that?” And so he did. They were not doing this in a classroom, they were doing this in the library, sitting on couches and comfortable chairs, facing a whiteboard, feet up on the glass coffee table they were circled around. Now, faculty can choose to despair at the image of students at the end of the semester just figuring out the utility of the practice problems in the back of the textbook. Or, they can choose (as I do) to be struck by the tableau of students teaching students not just the course material, but techniques for success in class, techniques that they can then take out of the current class they are enrolled in and apply to future situations. Student engagement is happening in the library–they are engaged with their course materials, they are engaged with each other (and not just in a social way), they are engaged with the stuff of intellectual work, one of the most important reasons for them to come to university. If such engagement is not happening regularly in the classroom, or, if the kinds of engagement that faculty are experiencing in classrooms are not satisfying (either to faculty or to students), then how can we bring the engagement we see happening in the library into other parts of campus? Could one part of the solution be a reconfiguration of space? I’ve been trying to think about space in the library here at UNCC in terms of a concepts I’ve borrowed from my colleagues: in environmental psychology, “behavior settings”, from architecture, “affordances,” and from my own field, anthropology, the idea of “places” as cultural constructs. “Behavior settings” refer to the cluster of assumptions that particular environments suggest to people upon entering the space (think of those velvet ropes that lead up to service desks–we know we’re being set up to wait in line). “Affordance” is a related concept (also used by people in Human-Computer Interaction), describing the range of possible activities/functions suggested by a particular space/piece of furniture/object. For example, a chair suggests a limited range of options (sitting), where a staircase wide enough to accommodate seating as well as walking (as in this example at the Sanford School of Public Policy at Duke) can suggest a larger set of possibilities (sitting, walking, meeting, talking, etc). Anthropologists approach “place” as the set of cultural meanings that are imposed by people onto physical spaces. I think it’s useful to keep all three of these concepts in mind when contemplating creating spaces that meet the needs of both students and their instructors, at universities and elsewhere. With our reconfiguration of our ground floor spaces (and I swear, we’re going to start reconfiguring other spaces as soon as we have the resources to do so! ), we have been consistently paying attention to what students were trying to do, both on the ground floor as well as in other parts of the library. We saw them trying to work in pairs or threes at traditional library carrels, we saw how overbooked our group study rooms were, we saw the syllabi requiring that students work in groups as a part of their coursework. Those observations helped inform the decisions we made to dedicate most of the ground floor to collaborative work spaces. In the same vein, paying attention to what faculty are trying to do when they are teaching should inform classroom design. Faculty are already (as evidenced by the roomful of concerned professionals at THATCamp Piedmont) thinking about novel ways to reach their students in the classroom. They should be partners with classroom support and facilities departments on campuses in planning classroom spaces, and experimenting with operationalizing those ideas with the help of different furniture, digital tools, and open minds. I know that some faculty (I’m thinking of @georgeonline here) are already doing this at their respective institutions. What’s happening on your campus to transform learning and teaching spaces? What works and what doesn’t? This entry was posted in Uncategorized and tagged #anthrolib, #proceedings, #thatcamp, academic work, furniture, library photos, space, workspaces on May 21, 2012 by dlanclos. The ephemera of academic work. Last week I went to hear Mary Flanagan speak about play, creativity, games, and how to think about social change in the context of game design and production. And this weekend, I’ll be attending another THATCamp, this one THATCamp Piedmont, at Davidson College just up the road. The prospect of going to another unconference, the content of Flanagan’s talk, plus the recent experience of opening our new north entrance spaces at Atkins library, have been making me think a great deal (even if I haven’t been blogging that amount) about the material nature of our thought processes–or, frequently, the lack thereof. What I mean is, there are times when students walk into the library with nothing in their hands but ideas in their heads, with a need to share those ideas (and get inspired by new ones) with colleagues. The physical environment they need for idea sharing is one that we’ve provided in the library: furniture near whiteboards. They can sit on couches, chairs, or at tables, and either use the whiteboards we’ve provided that can be moved around, or settle in spaces where you can write on the walls. Sometimes (many times) they bring laptops in with them, sometimes they bring books and notes with them. They work in groups, or they work alone. 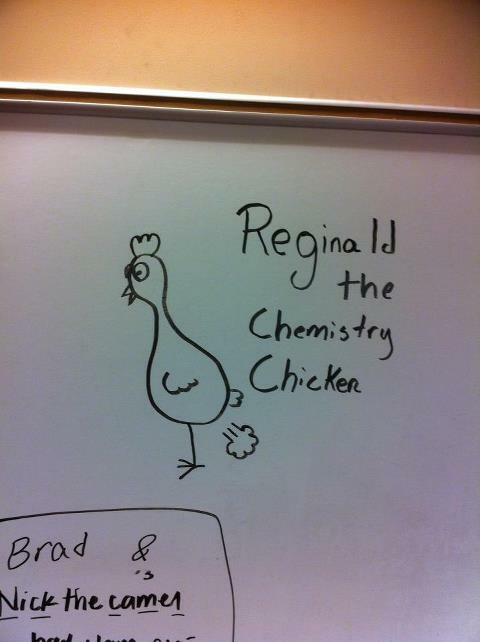 Sometimes, what they write on the whiteboards needs to go with them when they leave–if they are sketching out a work plan for a group project, if they are outlining a rough draft for a paper, if they are taking a problem set and solutions home. 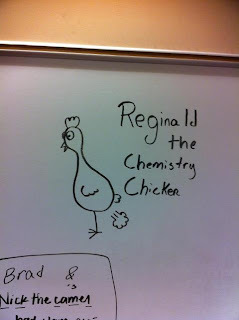 They often take pictures of the whiteboard (and the information they intend to curate) with their smartphones. This (on the right) is a good example of an elaborate study guide, using not just a whiteboard but also post-its. This diagram of the heart stayed on this whiteboard for several days during final exams last semester. We are actually thinking hard about what it would look like to have smart whiteboards, that could allow for the saving and sending of the stuff that students write down. The hard part is that we in the library don’t know which kind of work a student is engaging in at any given time–that’s why it is terribly important to build flexible spaces, that allow for patrons to have real choices about the work they need to do. It is in thinking about the ephemera of academic work that I was confronted by a design flaw in our new T1 Vision tables, in our north entrance study spaces. These tables (shows upper left) have a touch-screen embedded in the table that can be divided into four, as well as a large sharing screen on the adjacent partition. The large screen for sharing is only activated when a device is plugged in (or, in only a few cases in the touch-table applications). So, in this photo, the student has plugged in her laptop, and what is on the laptop is shown large on the screen for her study partners to see. If one of her study partners found something while browsing the web on the touch-table that she wanted to share, that’s currently not possible. And that does not fit with the way students work–they need to be able to share and think about things that come up during the session, not just what they have with them when they arrive at the library. The T1 tables dole out sharing capability as if the stuff that is savable/curatable is more worth sharing than the ephemera, and that is not true. Sometimes, academic work does not produce a material artifact. Sometimes, play does not take place in a score-keeping game, sometimes, play is open-ended, sometimes there are no winners or losers. But thinking is important, creativity is important, and it’s crucial for the library to produce and equip spaces that don’t just allow our students to write papers and pass exams, but also for them to think, to share ideas, to brainstorm, to bounce ridiculous notions off of each other that may go nowhere. That’s a “knowledge cloud,” according to the student who drew that. Thanks, Daniel W.
This entry was posted in Uncategorized and tagged #thatcamp, academic work, computers, library photos, new north entrance, space, work, workspaces on May 3, 2012 by dlanclos. 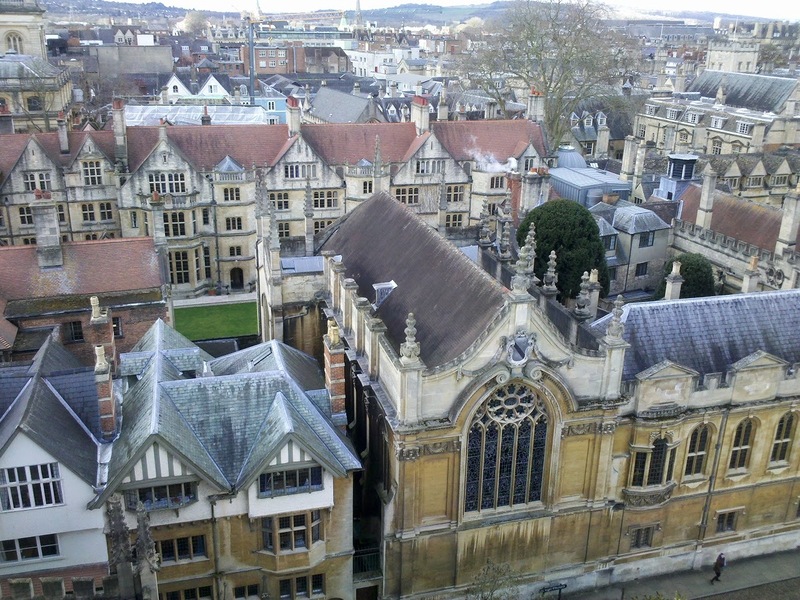 So, this lovely series of photos from stumbleupon shows a lot of university library reading rooms, primarily from old, historic libraries such as reading rooms at Oxford, UK, or in historic American universities such as Harvard, or UC Berkeley. I’m struck by how few people there are in these photographs. I understand that the photographer was probably more focused on the beauty of the spaces, but it seems to me that the true beauty of a library is in what the space provides in terms of the potential for people to think and work. So, yes, some of these lovely spaces do that. But we can’t see that in action in these spaces. We are getting new spaces in Atkins, and I’m curious to see how they facilitate student work on campus, and what kind of work ends up being done. The new north entrance to Atkins will be more than just a new doorway, there will be a large group study/conference room, and open spaces designed for collaborative work as well. 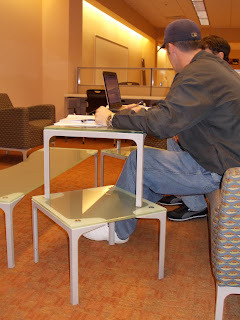 We’ve got spaces on the ground floor that have experimental furniture in them, and it’s still unclear if students are using the furniture (like this mediascape table) in the way it’s intended. There are also spaces on the 1st and 2nd floors in particular that are still relatively unconfigured–we haven’t really decided what we want to put in there long-term, so students are arranging those spaces themselves. I am going to be starting the New Year trying to investigate what students want out of these open spaces–what kinds of things are they trying to do, what kinds of things are they successful in doing, and what informs that success? Finals are nearly over–where are you doing your best work in the Library? What do you wish these new spaces to do for you? This entry was posted in Uncategorized and tagged academic work, furniture, library photos, new north entrance, space on December 14, 2011 by dlanclos.